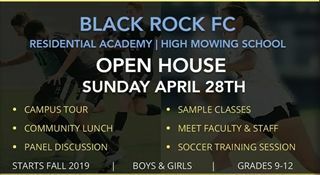 Black Rock FC Residential Academy | High Mowing School is a unique opportunity for high school students who want to take their soccer to the highest level. Our coaching staff provides a healthy competitive environment aligned with Waldorf education: top-level training sessions allow for guided discovery of the game through trial and error, to equip players to make good decisions under high-pressure situations and serve them for life well beyond the game. The experience is designed to seamlessly enrich High Mowing School Waldorf education and support students to reach their full potential. This year-round program allows boys and girls student-athletes to represent both Black Rock Football club and High Mowing School. In the fall, we compete against other New England Prep School Athletic Counsel schools and local High Schools. In the winter, we continue to train indoors on a field turf facility and compete against local and international clubs. In addition, we will attend 2-3 top-level College Showcase tournaments under Black Rock FC Residential Academy | High Mowing School. The program provides great exposure to numerous universities nationally. We support students with qualified guidance in the college recruitment process: recent matriculation for Black Rock FC players include soccer programs at Stanford, University of Michigan, Duke, Yale, UNC Chapel Hill, Williams, and Kenyon. The game of soccer provides challenges, inequities, teamwork, courage, and most importantly opportunities to grow that you can’t always learn in a classroom. Interested in learning more? Inquire here. Download the Black Rock FC Club flyer for more information about the soccer program.